I’m fascinated by how little she carried. Does it talk about what she ate? Thinking she was probably savvy enough to know what berries and greens along the trail were eatable. And to just knock on the door and ask to stay…yes, it surely was a different era. Sounds like an interesting read. Yes, sometimes she DID eat berries and greens! I think her bag, which she slung over her shoulder, weighed, if I remember correctly, 13 pounds sometimes??? Food is a big topic in the book!! Like you, I like reading about these epic hikers with no intention of doing it myself. I’m jotting this title down on my list. Thanks. This sounds like a must read for me. You need to quit reading so much and posting such good reviews because my book list is getting longer every day!!! Ah ah! I just committed to my Opportunity Knocks group to do four more posts in the next month. I want to KEEP reading this much! Through the Pittsburgh Botanical Society, Glenn knew one of Grandma Gatewood’s daughters, Esther Allen, who in her own right was a well-known and truly remarkable and knowledgeable botanist and naturalist. Esther gave many talks about her Mother. 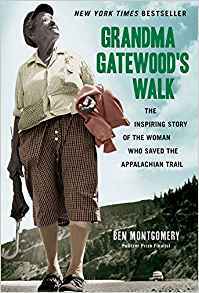 Did you know that Grandma Gatewood also walked the Pacific Crest Trail AFTER she became famous for hiking the AT. They were going to have a celebration for her at the end of the PCT but she was delayed two days so the organizers delayed the celebration until she got there. Did Ben Montgomery write about her encounter with the Bear? Her daughter Esther, was the final authority on trees, wild flowers and similar plants in Western Pennsylvania. Obviously, she learned much from her mother. Cool! Nice connection. Yes, Montgomery talks about the bear! I don’t find any evidence that Grandma Gatewood hiked the PCT which was designated in 1968 and completed in 1993. She died in 1973, so she could have done at least some io it! She DID however hike the Oregon Trail from Missouri to Oregon, which is also detailed in Montgomery’s book.